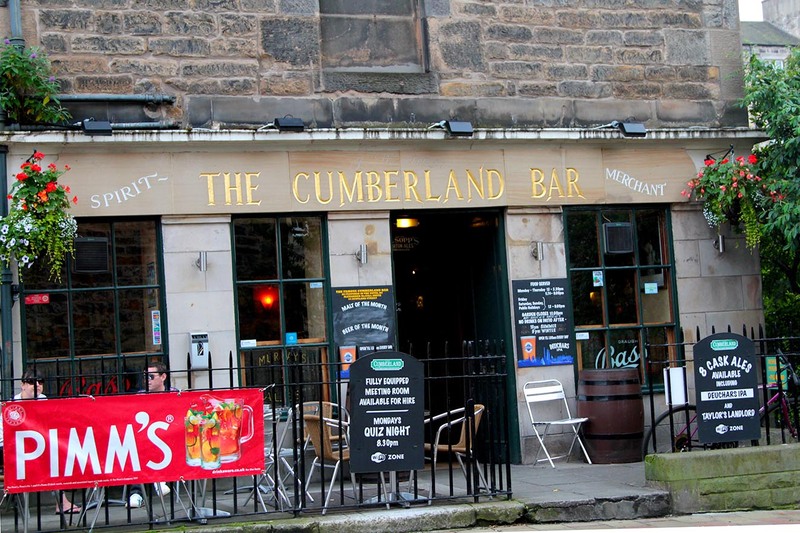 This is The Cumberland Bar in the New Town in Edinburgh. The Bar has been immortalised as the stereotypical New Town pub in Alexander McCall-Smith’s serialised novel 44 Scotland Street, the Cumberland has an authentic, traditional wood-brass-and-mirrors look (despite being relatively new) Many of the characters of the novels frequent the Cumberland including Bruce, Pat, Stuart and Matthew as well as Angus Lordie and his dog Cyril. Cyril is a beer drinking canine with a gold tooth who winks at the ladies. In one of the books Cyril is impounded under threat of death for biting, it is to the Cumberland Bar that he returns to celebrate his reprieve.